The Cisco 800 series routers are part of the “Branch Office” category, used mainly for SOHO purposes or for connecting remote branch offices to a central location. They are “fixed hardware configuration” devices, meaning that they don’t have any plug-in hardware slots for inserting additional interfaces to the device (all the interfaces are fixed). All the 800 series models come with a 4-port 10/100 managed switch used for connecting the internal LAN computers, and with an IOS software that supports security features including the Firewall set. The main difference of each model is the WAN interface. All models that end with “1” in the model number (i.e 851, 861, 871, 881, 891) have a 10/100 Fast Ethernet interface as a WAN port. The other models have an xDSL type WAN port (i.e ADSL, G.SHDL, VDSL2). Also, all models have the option of a WiFi Radio interface (the model number ends with a “W”, e.g 851W, 857W, 861W etc). 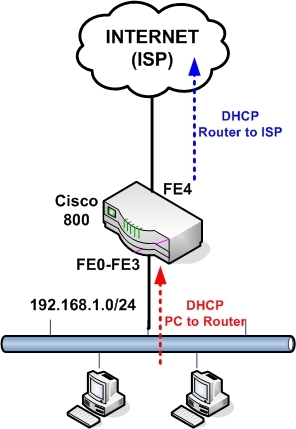 In this post I will describe a basic configuration scenario for connecting a Cisco 800 router for Internet access. I will use a model with an Ethernet WAN interface (such as 851, 861, 871, etc) since those models are the most popular. Something to have in mind for all 800 series routers, the four LAN interfaces (FE0 up to FE3) are Layer2 switch interfaces that are assigned by default to Vlan1. This means that you can not assign an IP address directly to the LAN interfaces. The IP address for the LAN-facing side of the router is assigned under “interface Vlan1”. On the other hand, the WAN interface (FE4) is a normal Layer3 router port, which means you can assign an IP address directly on the interface (“interface FastEthernet4”). I will describe three basic scenarios which are frequently encountered in real networks. Scenario 1: WAN IP address of router is assigned dynamically by the ISP. LAN IP addresses assigned dynamically from the router to the internal PCs. Scenario 2: WAN IP address of router is static. LAN IP addresses assigned dynamically from the router. Scenario 3: WAN IP address of router is static. An internal LAN Web Server exists. The router performs a static Port NAT (port redirection) to forward traffic from Internet towards the internal Web Server. The following is the basic configuration needed for the simple scenario above. This is the same configuration as scenario 1 except that the WAN IP address is static and also the default gateway of our ISP is known. Here the WAN address is static and we have also an internal Web Server for which we need to allow HTTP access from Internet. To do this we must configure a static NAT with port redirection. Traffic that comes towards our WAN public address 100.100.100.1 on port 80 will be redirected by the router to the internal Web Server at address 192.168.1.10 on port 80. What if you have a Linksys router connected to the WAN port, and on the same subnet? 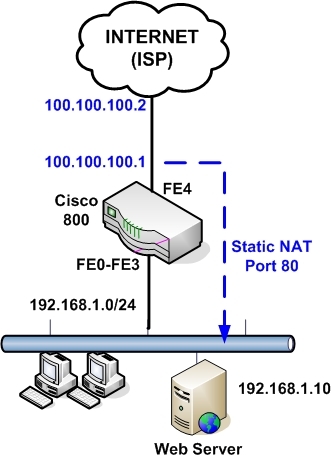 How should NAT/DHCP be configured so that clients on the switch ports receive internet? I can ping the internet IP, Linksys gateway, and Linksys clients, but I clients on the Cisco router are unable to connect to the internet. Since the Linksys router will be doing the NAT translation of the private IP addresses, you can have the Cisco 851 to work as normal router (without any NAT). The Linksys router should have a static route for the internal network to be pointing to the WAN interface of Cisco. Alright I am starting from scratch.. I am using only one static host off VLAN1 which I am able to ping the Linksys gateway, but I cannot ping Linksys hosts or my internet address. However, the Cisco router can ping all hosts including my internet, and any Linksys hosts are able to ping my static host off VLAN1. What am I doing wrong? Please let me know if I can configure DHCP still as it was not assigning my VLAN1 hosts any IP addresses. Greetings, thank you for the posts, they are extremely helpful. I have an 851W and have configured it as shown below. I can PING all interfaces and the internet when consoled into the router, and the PCs on the LAN can PING the GW (192.168.1.1/24), the PCs can even ping the IP adders of the WAN port (FE4) in the router. However, the PCs cannot PING beyond FE4, that is, cannot PING anything on the Internet. What have I done wrong? Thank you in advance for your help. wild card mask should be used instead of – right ? You are right. I have corrected the mistake. we just received router 881 router from our ISP for our 10meg pop, i am just a bit concern since they provided us with static ip’s for our lan connection, is there a way i can create something like 192.168.1.0 network on the other interfaces? i know what you assign in the Int VLAN 1 would be the lan. Yes you can assign another vlan to a second interface of the router and put another subnet on it. This is like having a router with three interfaces, one WAN and two internal interfaces. I configured nating as shown in your example of the topolory with the webserver and the problem that we are having is that all incoming HTTP requests are answered by the embedded webserver in the eouter not my the actual websrver on the inside. I had an engineer from Cisco work almost 2 hours this last Tuesday and could not resolve this issue. I’d appreciate any thoughts that you’d care to share! 2) change the port number that the internal server is listening from 80 to something else. I’ve tried everithing I know (not that much :-), HELP! The configuration looks ok. Try to find out what is the IP address and default gateway you are receiving on the WAN interface (fasteth4). 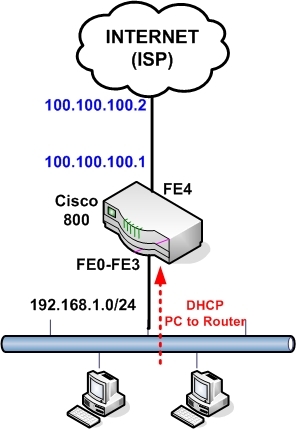 Run “show ip route” and see the routing table of the device. From there see the default gateway IP and try to ping it from the router. I’ll try this, thanks a lot! Hello, I’ve tried this, working in the router I can access the gateway IP, I can ping others IPs, but no way from the workstation (neother from WiFi conn nor RJ45 connection). Thanks! Hello, though I see the default gateway, and I can ping it, there’s still no connection neither from wifi connections nor RJ45 connections. Everything is working except that user in the inside network can not ping the static natted ip address 41.220.25.185 but can access on 192.168.0.200. May you assist me please why its not? Everything looks correct. The only gray area is the routing table. Do a “show ip route” on the router to see what’s going on with the routing table. Hello. I have cisco 891 router and it was configured with scenario 1. But I have no internet connection on my PC. Here is my configuration. Please help me. Thank you. Replacing route works for me! please can someone help me out, i have done all the necessary configuration but still can access internet. 1) From the router itself, can you reach (ping) the default gateway (41.76.81.201) ? 2) you are assigning a DNS IP of 10.0.0.3 . Is this an actual DNS server? 4) from a computer can you ping the router? (10.0.0.1) ?